to Karl's for berries. I put them up after I came home and in the afternoon went back to town and stopped at home to help sew. Ida went with me. It is a very warm day. The boys are making hay. Wednesday July 10th 1901 The weather today was terrible with a hot wind I could not do much of any thing. The boys finished haying. 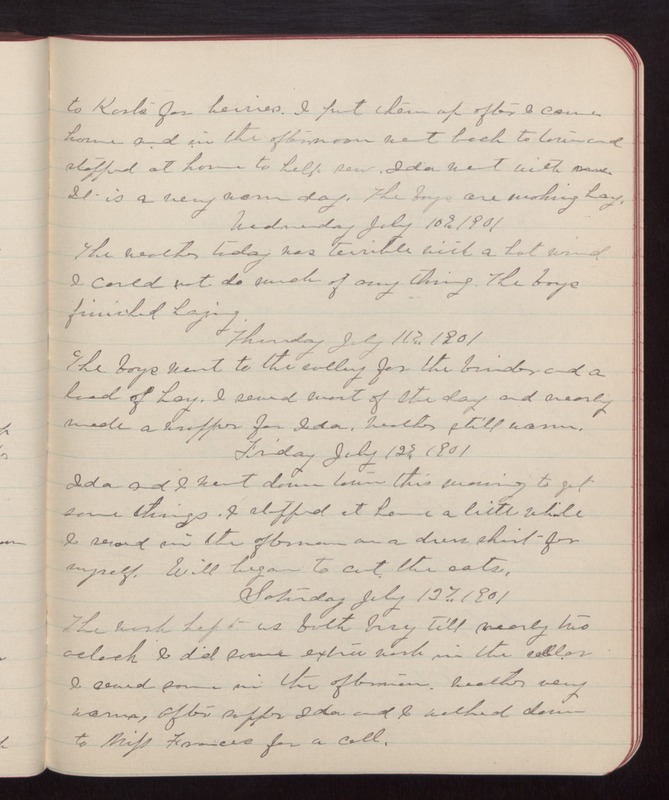 Thursday July 11th 1901 The boys went to the valley for the binder and a load of hay. I sewed most of the day and nearly made a wrapper for Ida. Weather still warm. Friday July 12th 1901 Ida and I went down town this morning to get some things. I stopped at home a little while I sewed in the afternoon on a dress shirt for myself. Will began to cut the oats. Saturday July 13th 1901 The work kept us both busy till nearly two oclock I did some extra work in the cellar I sewed some in the afternoon. Weather very warm. After supper Ida and I walked down to Miss Frances for a call.